We were saddened to learn of John’s passing last week. John was a hugely popular member for many years and a credible performer for the club on the road and XC. I first met John in 1986. Martin Crabb and I were coming to the end of an afternoon run and encountered a lone jogger on the Leys. During a quick chat we urged him to join a session of the then fledging WRR. Next evening he did and a firm and an enduring friendship was born. John, a no-nonsense Glaswegian, moved south with his young family early in 1978 to take up employment at BL Cowley and the family settled in Witney. He had been an accomplished athlete for Glasgow Schools but after allowed this talent to lapse due to work, social and young family pressures. champs) the more he enjoyed it. He was a consistent performer at London Marathon, but Snowdonia week-end was his! At his first attempt in 1987 I advised him to go steady for the first 10km climb and save himself for the tougher second half. Oh, not for John – he took off up the Pen-y-Pas and was home and hosed by the time we caught up with him at the finish in Llanberis. (And he’d knocked 15mins off my time of the previous year!). In road relays and major XC Champs across the country he scored well for Witney. I recall after one bitterly cold Southern Counties Champs we eventually found him in the medical centre, trussed up in foil like the Xmas turkey – a bad case of hyperthermia. He was a pretty good all-round sportsman, one year being elected captain of Kirtlington Golf Club and most Tuesday evenings he could be found at the snooker table with a group of mates at the Windrush Club. John’ decisiveness and problem solving skills were soon noted in industry and after moving upwards he eventually he took up a senior position at Rover, Solihull. For many years he made the daily commute from Witney and we were to see less of him at club sessions and events. The past few months were not kind to him. Painful therapy and surgery with numerous trips to London and the Churchill Hospital followed but he never lost his keen sense of humour. In recent weeks we met as frequently as possible and over a pot of tea we chat about life in downtown Glasgow in the 1960’s and would reminisce about our shared experiences over the past three decades. We laughed so much and vowed that when able we would once again share a good bottle of a malt whiskey. Sadly that opportunity never came and that bottle remains unopened. I will miss him. My thoughts at this time are with Louise and their children Paul, Jennifer and Clare. Johnny Barr’s favourite phrase will always be remembered, although for a long long time, I thought he was warning us of the arrival of the latest Marvel Superhero! 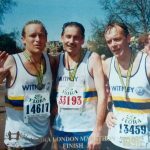 John was a massive influence and inspiration to so many fledgling runners in those early days of the club. His achievements were legendary, his humour cutting, brutally honest, yet always with a cheeky scottish chuckle. Him and Jan at the front of the Sunday 20-mile training runs, no-one allowed to pass them until the 10 mile mark, then it was a free for all. Great fun, remembered with real affection. A great man, a great family man, a great club member, he will be much missed by all who he came into contact with. Keep on running, John, but Run In Peace.